Nos 13/23 Clarence Street (left) and 26/28 Linenhall Street - the planning application is understood to be recommended but not formally approved. The NI Planning Portal shows “under construction”. The proposed redevelopment of a site at the corner of Linenhall Street and the southern side of Clarence Street. 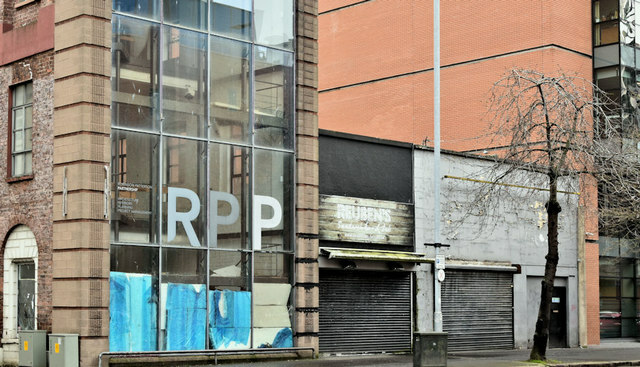 There is (July 2015) the following application for planning permission “LA04/2015/0674/F 13-23 Clarence Street Clarence Gallery Linenhall Street 26 Linenhall Street and 28 Linenhall Street Belfast BT2 Demolition of existing building and construction of new 9 storey office building plus plant level storey”. The Clarence Street building seems to have been a box works for a significant part of the twentieth century. The photographs submitted by me appear as a neutral matter of record only. I have no connection with the applicant or any objector(s).